The Savvy Stager: My Fabulous Kitchen Makeover! And another, showing the ugly "fake oak" peninsula island. I absolutely hated that thing, and the sconce thingamajiggers were there to hide an ugly blemish. I had some better pictures, but back to my blogging inexperience, I couldn't figure out how to get them turned from sideways to right side up. Here is our peninsula island that we put beadboard and molding on. I LOVE this part of the kitchen now! 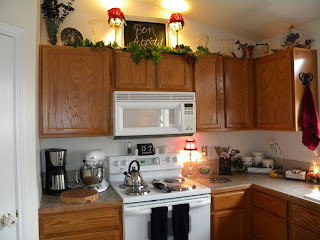 Here is just some of the decorating I've done on top of my countertops. I was hoping this picture would show a little more of the beautiful brownstone (I think that's what they're called) hardware. So here they are, and I am soooooo happy with them! Quite a few people thought I was off my rocker going black, but I am so glad I did! Thanks so much for checking them out! I am going to attempt to link up to metamorphasis monday and make your monday, that is, if I can figure out this link thing! Wonderful changes! Makes the room look fabulous! All I can say is, "Oh WOW Missy". 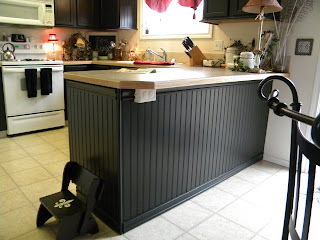 Your kitchen transformation is unbelieveable! This is a first class re-do!!!! Kudos and Congrats on your new and very updated kitchen! Very nice. I know you love it. I just got thru painting mine black also and everyone thought I was crazy. They are all in awe now!! I love black cabinets! It's beautiful! 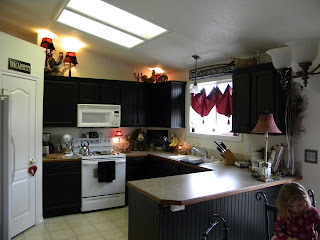 Wow your kitchen looks great, love the black! Very nice, you must love your new kitchen! I have a client who just had me give her an estimate for a black kitchen! I reeaaaaalllly hope she goes for it! This looks great! Stop by my painting blog and say hey sometime! I love that!! You did an awesome job! Good for you for taking the leap despite what others said! I love the black. Your kitchen looks beautiful! I love the black cabinets! Very nice! I have not posted for awhile but would love to have you visit my blog and if you like sign up. It you scroll down and hit some of my older posts you can see what my home looks like. Welcome to the wonderful world of blogging! And I love your black painted cabinets, I think black cabinetry is way underrated! Great transformation! I love your kitchen! Come stop by my Favorite Things Friday Party if you would like to join in! you did a beautiful job on this makeover! i hope you will send me any tutorial post links you have so that i can catalog them in my PROJECT: LIBRARY. all projects welcome, 24/7/365...see you soon! 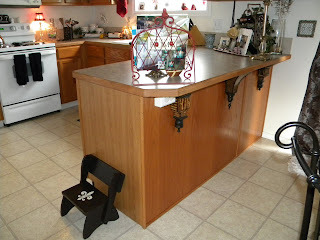 I love the little step stool, everything looks beautiful! the cutest blog on the block. they give great freebies and go to tips on blogging.. 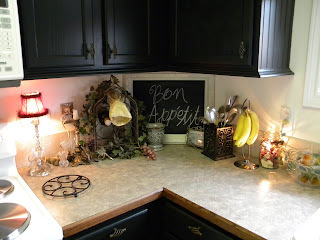 But I love your Blog ..so cute.Love the before and after pics..
Love your kitchen makeover! I'm a new blogger too and just found your blog. Feel free to check out mine - I'd love to know your thoughts! The black cabinets give the kitchen a huge lift. Very updated now. Looks terrific! Thanks for visiting Recaptured Charm.